In a total departure from the three previous ATCs I did not begin this one with tissue paper. 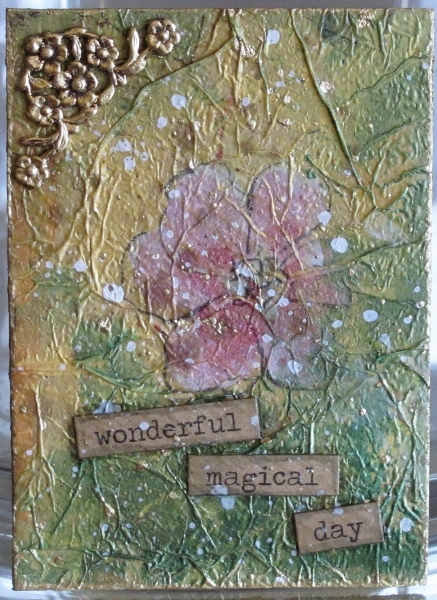 Instead I glued down a background of handmade paper with dried flower inclusions. To do this, I applied clear matte medium to the chipboard and the paper and pressed them together. I used three other handmade papers and hand tore shaped bits to create flowers and buds. Each piece was glued on with the matte medium. This was all built up one piece at a time, sealing the fronts and edges so there would be no loose bits. After drying overnight I used a fine permanent marker to sketch in some outlining. Silver Krylon paint pen was used to cover all the edges of the card. 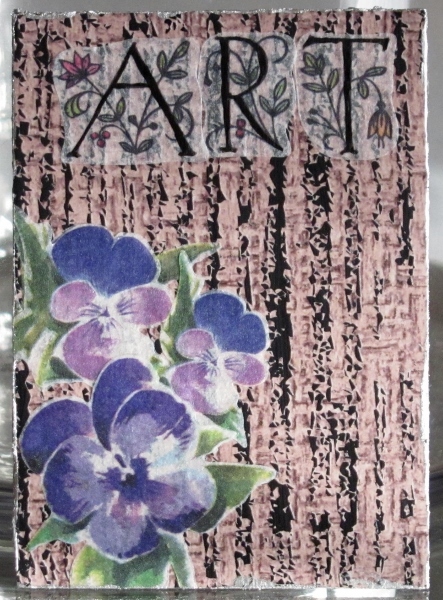 For the third ATC I required to fulfill my swap I again started with printed tissue over chipboard. In this case it was a multi-toned yellow with some black fine line swirls. Over this I applied some rose stickers in the upper left and lower right corners. 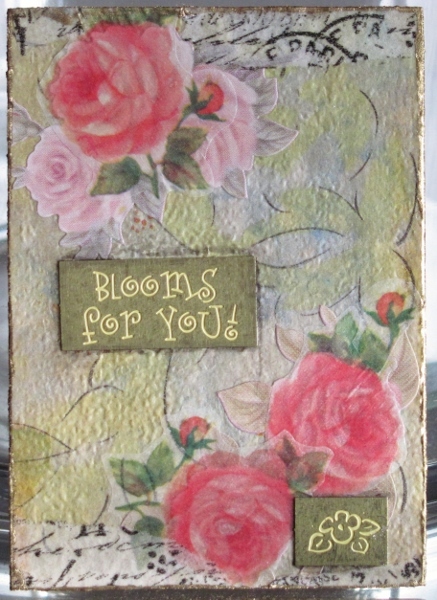 These were overlaid with vellum rose stickers to create a more dimensional effect. I added torn bits of tissue tape to the top and bottom edges then used Glossy Accents to adhere two gold etched plaques. I sealed the whole piece with clear matte medium and allowed it to dry overnight. I used a black soot Distress Marker to outline the gold plaques and smeared the ink. To finish it I used gold Krylon paint pen on all four edges. I didn't mention mention in my post the other day how much I do not like making Artist Trading Cards. To me they are rather pointless as they are not a greeting card, are rather too small to work comfortably upon, and since their sole purpose is to trade them to someone I generally get back some art that I really do not care for. That said, I discovered after I had committed to the ATC swap for florals that it was a 4-for-4 swap and that I had to make three more. Drat! Since they will all go to the same person I really coudn't duplicate the one already done so I dragged out some supplies and set to work on new designs. The first of these began with some brown printed tissue over chipboard. I used some distressed stripes black rub-ons to finish the background. I arranged two layers of three vellum pansy stickers (two layers so the background would not show through) and added decorative vellum letter stickers at the top. The whole piece was sealed with clear matte medium then the alpha letters were traced over with black permanent marker. I finished this off by covering the edges with silver Krylon paint marker. Finished size is 2.5 x 3.5 inches. I wanted to run through the techniques I learned in the making of the piece yesterday (12 Tags of 2015) but I needed an ATC card for a swap. 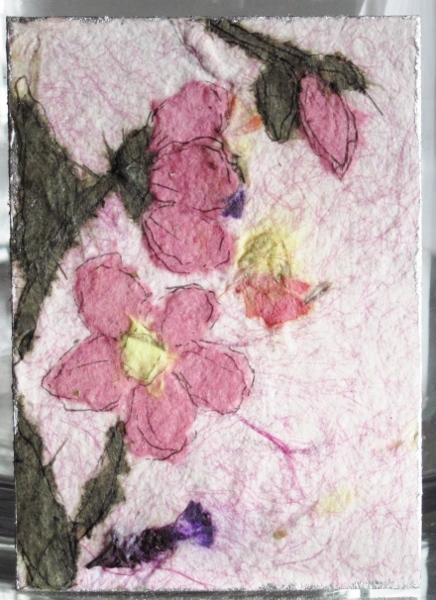 The theme for the Artist Trading Card swap was 'flowers' so I started with a tissue with a floral print. I made sure to use less of the acrylic paint at the beginning so as to not obscure the print on the tissue like I did on the last one. Otherwise, it is put together pretty much the same with all the spatters, spritzing, heat drying, layering, and adding words and charms.